-That's the way you finish off a road trip. -With tonight's victory, Erik Spoelstra (453 wins) is one win away from matching Pat Riley for franchise wins record. -Goran Dragic was aggressive tonight finishing with 19 points in three quarters of action tonight. -Thanks to the Heat bench for pushing the lead in the fourth, Dragic's night was done early. The bench found some success offensively with key scoring from Wayne Ellington and Tyler Johnson, who scored all 14 of his points in the fourth. -Justise Winslow has now made a three pointer in four consecutive games. It's the first time he's done that in his career. His shooting has improved over the past few games. -His finishes at the basket? Still a work in progress. -After a dismal shooting percentage against the Nets on Saturday, Dion Waiters bounced back and played well tonight. He didn't force anything and made great decisions on his drives to the basket tonight. -Adebayo had the early task of guarding Marc Gasol after Kelly Olynyk picked up his second foul with 9:01 minutes to go in the first. The rookie not only held his own defensively, but also did his part offensively while recording eight points, one block, and a steal in the first period. 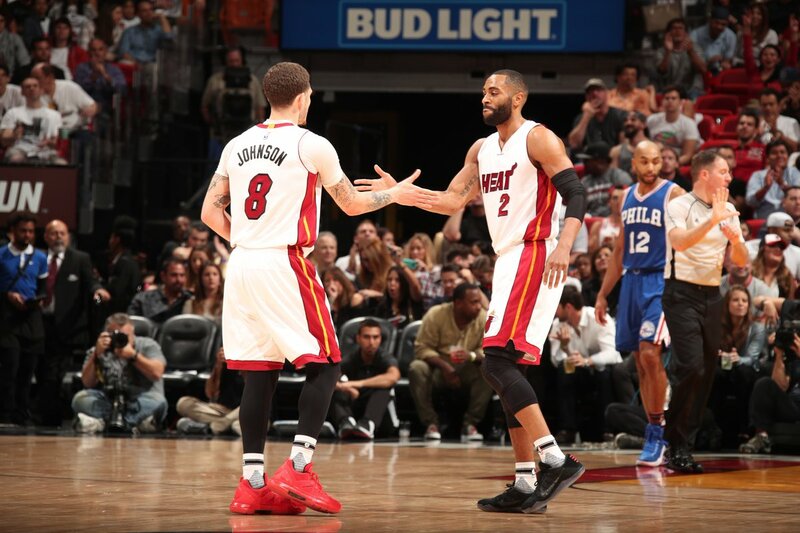 -The Heat will now return home to face the Portland TrailBlazers on Wednesday at the AAA.